Apple’s iPad 2 (s aapl), expected to be shown off in the second quarter of this year, is looking more likely to have its own “retina display” much like the current iPhone. The MacRumors blog reports the next iPad’s resolution will be 2048×1536, or double the current iPad resolution, both horizontally and vertically. This would allow for easier backward compatibility with current iPad software and open the door to new, highly detailed apps. It may also pave the way for a larger iPhone in the future for several reasons. It can still be a “retina display.” The iPhone 4 display shows 330 ppi, or pixels per inch, but the definition of the “retina display” marketing term isn’t solely based on the ppi. If it were, then reported 2048×1536 won’t qualify because on a 9.7-inch display, that only works out to 265 ppi. The other part of the equation is how far the screen is from the eye because the further away one holds the device, the harder it becomes for the human eye to resolve individual pixels. Based on my personal observations of how people use mobile devices, one constant generally holds true, with few exceptions: The larger the display, the farther the device is held and used. Meaning: a 4-inch iPhone at 960×640 resolution, or 288 ppi (a greater density than the expected iPad, by the way), could be held out another inch or two from today’s iPhone and still appear to have the same visual quality. The competition is bigger. Nearly every hot new smartphone I saw at the Consumer Electronics Show that will be compared to Apple’s iPhone had a few common denominators, with one being larger displays. Most had 4.3-inch screens, some with the standard Android (s goog) resolution of 800×480, but a few with what are called qHD screens. These use a 960×540 resolution, or nearly that of the iPhone’s 960×640. The trend for larger displays on high-end smartphones is growing, not shrinking. A larger display won’t impact phone size that much. Barring a non-button approach, increasing the display size of a phone is sure to make the device bigger. But the size boost could be marginal. Samsung’s Galaxy S handset, for example, uses a 4-inch display, as compared to iPhone’s 3.5-inch screen, but the Galaxy S isn’t much bigger, even with its front-facing camera and home button. The Samsung phone measures in at 122.4 mm (4.82 in) x 64.2 mm (2.53 in) x 9.9 mm (0.39 in). Apple’s iPhone 4, with a smaller display, is 115.2 mm (4.54 in) x 58.66 mm (2.309 in) x 9.3 mm (0.37 in). The difference in size is negligible. Mobile video consumption is on the rise. Although I’d argue that watching video is more enjoyable on an iPad, Android tablet (s goog) or even a notebook computer, video consumption on the go continues to increase. A Bytemobile study in October reported that mobile video traffic was 39 percent of all data traffic, eclipsing even web traffic on mobile devices. Granted, video over the web can use more traffic than all other activity types, but this is just one data point. Early data from after the iPad launch indicated that consumers use the device three times more to watch video than traditional web users. And YouTube Mobile traffic nearly doubled in the second half of 2009 from the first six months of the year. It’s great to watch video on the iPhone’s 3.5-inch retina display, but the experience improves with a 4- or 4.3-inch screen with a similar resolution. One the of the biggest arguments against a larger iPhone screen is that it won’t be considered a retina display any longer. If iPad 2 at 265 ppi qualifies, then surely an iPhone with 4-inch display at 288 ppi will too. And while much of this argument hinges upon the screen resolution of the next iPad, I can’t believe that Apple’s iPhone will use the same screen size forever. There’s simply no reason the handset can’t gain a boost in screen size, while still keeping the resolution crisp on a device that’s easily pocketable. The entire experience improves with a larger display because users feel less constrained– not just for video — web browsing requires less zooming, gaming controls feel more spread out and it’s easier to use the keyboard. To me, it’s not a question of “if” the iPhone gains a larger display, but rather one of “when,” and I suspect its coming soon. I’m curious to hear thoughts from readers to see if this would be welcome change or it’s simply not needed because the iPhone 4 screen with its retina display is perfect at 3.5-inches in size. I agree, the iPhone should have a larger display! I did a side-by-side with a Android in the AT&T store last month, and the screen was larger on the droid, and the phone was thinner. The Samsung Captivate was the model, with a 4″ screen. It wasn’t much larger than my iPhone 4. The size difference really did make a difference, and I could NOT tell the difference in watching the same youtube video on each phone. This was holding both phones at the same distance, which for my sight, is better at bent-arms length than close. Some of us are getting older…. I never wanted a droid based phone before over an iPhone, but the screen was NICE. I would love to see the iPhone 5 have a 4.5″+ screen! Not sure how possible this is, but the overall size of the phone should be able to stay the same. Move the earpiece and camera up a little, and move the home button to a HARD button on the top or side. I would actually prefer that! A button like one of the volume up/down buttons. Just my 2 cents. I started a website dedicated solely to the upcoming iPad2. Would really appreciate anyone who want to check us out, and interact with us! after playing with my sister in law’s Samsung Focus, i can say id’ really enjoy a 4″ screen. Not all that pleased with WP7. I think it could use a little more polish. Soemthing more with the tiles…but i’m rambling. I think 4″ screen is the new sweet spot. not to small but still very pocketable. I believe the iPhone 5 will be 4 inches (or greater) because Apple needs a larger PHYSICAL CASE SIZE anyways to be able to incorporate new internal hardware components as they are expected to stuff Dual Core CPU and multiple radios (CDMA, GSM, LTE) in a single “world phone”. Apple does not want to create many different form factors for each carrier. They will use economies of scale to yield maximum profits for sure. So since the actual case will be larger it only makes sense to go with a bigger screen. BTW, I believe the newer display will have a HIGHER RESOLUTION and will not stay the same as some here suggest. Now that Steve is a largely absent CEO, the pace of innovation may slow considerably in Cupertino without Steve’s ginormous shadow over everyone’s shoulder, especially in the company cafeteria where awesomest maximus brainstorming sessions occured. I hope Steve makes it back but it doesn’t look good and tremors and mini shockwaves are being felt around the world today. His Medical Leave is already by far the biggest story of 2011 and likely to remain that way for the rest of the year. I think that the ipad2 will have a hi-res-screen, but i’m not sure that it is de-facto the reason why the Iphone5 will have a larger screen. I think 1920×1280 is a more likely resolution for the ipad2 too however. If for some reason iPhone and iPad had to have the exact same pixel density then iPad could also get a little smaller. But I don’t see why they would have to match at all. And people like the size of iPhone compared to the boat anchors some vendors are shipping. A bigger backlight would mean more battery drain also. Retina Display is primarily about being about 300 dpi, because that is a magic number in computer graphics, and has been for decades. It represents “print resolution” and is the dpi setting at which most of the world’s master artwork is stored. It’s also the multiple by which device resolution is measured â€¦ the ruler goes 72 (points), 150 (half of 300 â€” typically used for drafts), 300, 600, 1200, 1500, 1800, and so on. The typical workflow is to create artwork at 300 dpi and when you’re done, send the 300 dpi to a printer (which may render it at 300 or 600 or a higher multiple) and create a low-res version at 72 dpi for the screen. Retina Display gets rid of the need to make a low-res version and makes the screen just another print device, which can render the 300 dpi artwork. If iPad 2 has 288 dpi that is probably close enough, but if iPad 2 were 9.2 inches instead of 9.7 it would exceed 300 dpi. Nice if true but I don’t see it. Apart from being cost prohibitive for developers there would be more work involved accommodating the extra resolution. Not this generation but the next. Glenn, what extra resolution? My thought is that the resolution stays at 960×640, but on a slightly larger screen size. No additional development work or modifications would be needed. As a developer, I can tell you that to support an increased resolution, the graphics assets would need to be much bigger. That’s a lot of work, I can tell you, I personally up-rezzed the designs for the BBC Listener app, and it took me a couple of days. This is especially true if the original assets weren’t created with scalability in mind. Re: You’re comment that we could see an increased size of iPhone, I would respectfully disagree. Apple spend many, many man hours adjusting the form and fit of their devices, they do not leave a thing such as size to chance when designing these things, they build every size to be sure. They to, quote Steve, ‘pick their horses well’. When he said ‘nobody wants a big phone’ it is because he has tried it out, and while I’m sure you have used the bigger form factor in Android, they made their choice to appeal to all, not men between 5 and 6 feet high with big hands. The form factor will stay, I’d bet my house on it. Same for the iPad. The number of pixels would stay the same at 960×640, but the resolution would go down: from 330 dpi to around 300 dpi. There are some apps that would have to be rebuilt because they specifically rely on a 3.5 inch screen. Rulers, for example. But mostly it would be an adjustment for users, relearning to type, finding bigger pockets. I can’t imagine how it would be worth it. Next generation iPad is expected to arrive sometime in April if Apple keeps the annual release schedule. According to reports, the new iPad will feature multi-core processor (Appleâ€™s new A5) with better graphics, screen resolution of 2048 x 1536 (double of the current model), and SD card reader. Some reports also suggest that the iPad might lose its Home button as its functionality is being replaced by finger gestures. I believe nothing untill ipad 2 launch. now, I still enjoy my ipad and iFunia ipad video converter which I have get in the same time. I think other will do the same once they try it and realize it is the perfect phone. all the apps & their UI elements are designed around a 3.5″ screen at 960×480. by making the screen larger while keeping the same resolution it would lower the ppi making all of the UI elements larger instead of smaller, therefor not hampering usability. the only problem it could cause is if dev’s start designing app UI elements around a 4″ screen instead, it could lead to the 3.5″ version of the same app with a UI thats to small. this is a huge reason why apps should be designed around PPI over resolution & 1 of the reasons Android is pushing it so hard (many screen sizes & resolutions). As long as it fits in my shirt pocket, I ‘d love to see it a bit bigger. My fingers barely pick out the soft keys on the screen. I ‘d like to see min. 1080p resolution. If Apple coupled it with an LED thin film backlight, it would still consume very little energy. Of course, making sure that it stays at the 326 ppi IPS type of LCD. I think the ideal size would be the 4.5 to 4.75 inch display in a 16:9 aspect ratio. If it were bigger, it wouldn’t fit in most shirt pockets. Certainly, 4.5 inches would not. That is ridiculously large for a phone. If we put a 1080p iPhone in your left hand and the current iPhone in your right at the typical useful distance you wouldn’t be able to tell which is which. That is the part about “Retina Display” â€¦ iPhone already has pixels that are too small to be seen with the naked eye. Adding more gains nothing. 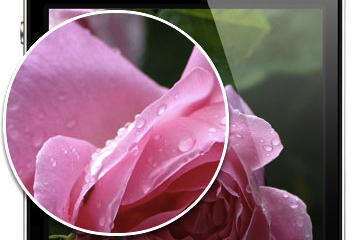 iPhone 4 already has about 1.5 times the resolution of a photographic print, and many times the resolution of an HDTV. If you want a big video screen, get an iPad and a little tiny book bag to carry it in. Movies look fantastic on iPad, and 10 inches in your lap is bigger than most HDTV’s sitting across the room. If iPad 2 has Retina Display you will get your 1080p, which will be too low-res and have to be scaled up. Small increases in phone size make a big difference to one-hand usability and pocketability – personally I wouldn’t like to see a bigger iPhone. As a Dell Streak user (5″ screen) I can attest to the advantage and appeal of a larger screen. I agree, Apple will change on next iPhone. Oh, so you’re the one who bought a Streak! As an iPad user, I can attest to the advantage and appeal of a larger screen. I think it is Dell who will change on the next Streak. Good analysis – makes a lot of sense. For reading technical eBooks (that are designed for print) I think the current iPad’s resolution is too low. Kindle DX which is designed for these type of eBooks has a resolution of 1200 x 824. Though it’s probably a minority use-case. On the other hand the iPhone 4’s pixel density is probably a little bit too high – a bigger screen would make zoomed-out desktop websites a little easier to read. Kindle can’t show color, which makes it totally unsuitable for technical books, which have color diagrams. Kindle books also lack layout features that are required to render technical books correctly. A lot of charts and graphs have to be refactored to even be visible on Kindle due to no color. Apple just released a 6 book set of iOS programming books in iBooks Store which run in iBooks v1.2 with layout and color and look exactly like the print versions. The idea that Kindle is a better experience than that is ridiculous. Kindle is for pulp fiction, text-only with no layout. That is why romance novels are the number one seller on Kindle. iBooks also supports audio video, so it can run books like Scott Kelby’s Photoshop tutorials, which currently only ship on DVD or in Web streaming. They should be digital books. If you find iPhone’s resolution to be too high, simply zoom in, scale the content a size larger. iPhone’s 330 dpi is the closest thing we have to true print resolution. How will the battery lofe be with such a display if the device isn’t going to be bigger and the current iPad is weighed by the battery inside of it?